Divyanka Tripathi clarify her stance with ex-boyfriend Ssharad Malhotra! Divyanka Tripathi is one of the most popular faces on the small screens. The “Yeh Hai Mohabatein” fame actress has been in the news , for her wedding with her co-actor Vivek Dahiya in recent times. It was said that Divyanka’s marriage grabbed more headlines than the top Bollywood hot gossips. This shows the impact of this actress. Divyanka has numbers of fans in her social media handles. But, recently some fans abused her and used some non-social words against her. 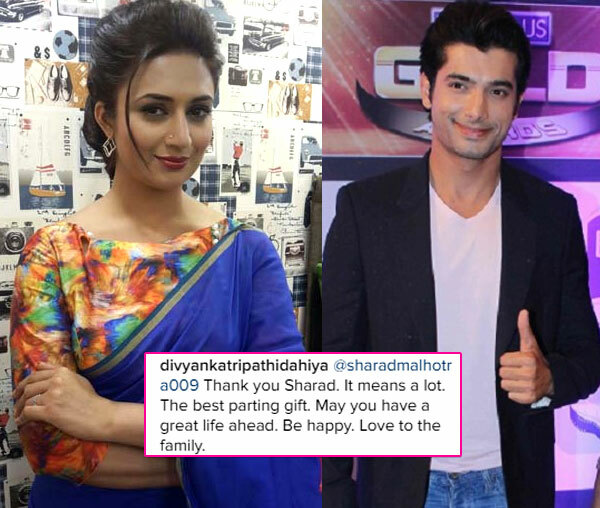 Don’t get shocked, they were not the fan of Divyanka, but the fan of Divynaka’s ex-boyfriend Sharad Malhotra. Divyanka broke up with Sharad last year and even, this also grabbed the headlines. And, it is believed that Sharad’s fans were disappointing with the marriage of Divyanaka and Vivek. They were also accusing her of dumping Sharad Malhotra. Meanwhile, Divyanka approached his ex-boyfriend Sharad to calm down his fans and asked him to help her in this situation. Well, Sharad being a gentleman asked his fan to stop doing all these non-social things. The actress further posted her picture this morning and captioned it “Peace within” that proves that how relieved she is feeling right know. Although, still both the fans of Sharad and Divyanka are attacking each other with the arrow of abusive languages. Meanwhile, Sharad’s current girlfriend Pooja Bisht is feeling so much proud of his boyfriend as she respects women a lot.